How is a Team Leader’s workday? As a team leader for the German team, you will continuously work to monitor queues, quality and your employees’ achievements. You will act as a mentor, leader and support for the team agents and with your help and support, the team will perform on top, every day. You will ensure that new information and guidelines reach the agents and that they understand all the information so they can communicate this in a good way to the customers. In addition to the main task of being available to the agents, you will compile reports including key figures such as response times, number of tickets, time management and other relevant numbers as well as presenting these to the Customer Service Manager. You will also be part of a number of project groups aiming to increase quality and efficiency within the company. Who is our new Team Leader? You who previously worked as a team leader or equivalent in customer service and want to take the next step into a fast-growing and energetic workplace will enjoy your stay. Here you can be yourself and you are encouraged to bring your own thoughts and ideas about your work. The cohesion in the working group is strong and they all give a warm welcome and rapid inclusion in the group. At regular intervals, the company and the customer service team go out and have dinner together, watch a football match or, if weather permits, take the catamaran and go out to the blue lagoon. Are you the past familiar with case management systems it is meritorious. You are independent and should enjoy working with language and text. It is important that you are available fairly soon. Scandistaffis a licensed (lic. 130) Scandinavian HR-partner that specializes in the recruitment of skilled iGaming professionals. We match candidates with attractive companies in Malta, Gibraltar and the rest of the UK. Scandistaff offers the possibility to take part in exciting opportunities at attractive companies that rarely reach the open market. Follow us on Facebook, Twitter and our website to find out about the latest vacancies for Scandinavians in Malta, England and Gibraltar. Do you want to be the Team Leader? The recruitment is on-going, so please apply immediately. 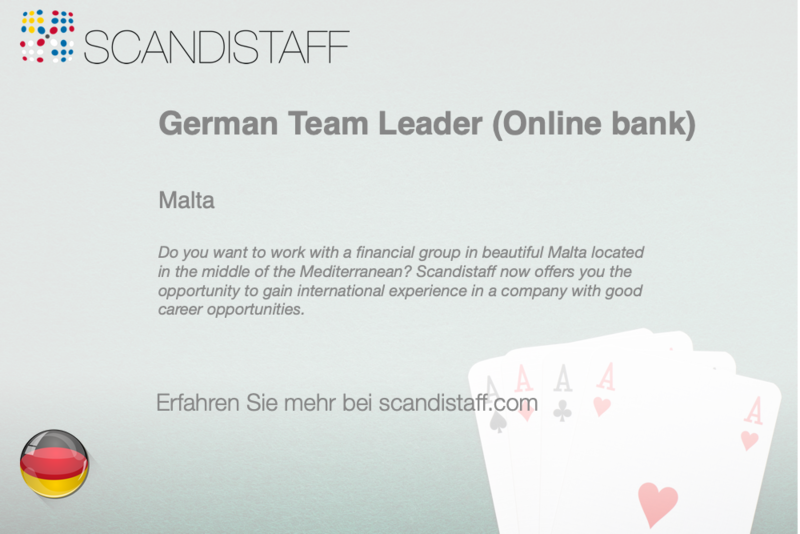 Send your application through our website http://www.scandistaff.com/apply. Please note that we need the application in English. Tell us about someone you think fits the job and you will get a tip bonus if he or she gets hired. If you have questions, please contact the recruitment manager Carl-Henrik Larneryd at phone number: +46 (0)31-3139318. You can also reach us through our Skype client: SCANDISTAFF.